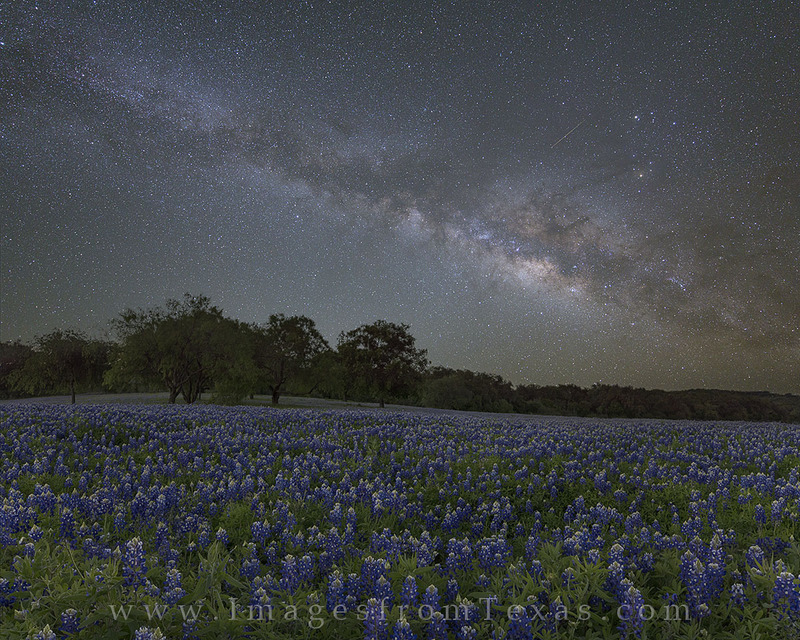 In the early hours of the morning and well before sunrise, the Milky Way appears over this beautiful field of bluebonnets in the Texas Hill Country. To achieve maximum sharpness, this image is a composite photograph. The foreground was taken about 45 minutes after sunset when just enough light allowed some depth and clarity to show in the bluebonnet landscape. A little after 3am when the Milky Way was in position, I used a star tracker to take a long exposure of the night sky. Back at home, and after some sleep, I used photogshop to blend the two images together to show what they eye could see but the camera could not capture. I had not noticed the meteor in the Milky Way photograph until I got home. Sometimes you just get lucky! Photo © copyright by Rob Greebon.